Are you considering a new podcast or upgrading your equipment for an existing one? We reached out to some of the top podcasters we know and asked them what tools, apps and equipment they use for podcasting and they came back with a very interesting list. Podcasting will continue to grow at a rapid rate for many years to come. What YouTube is doing to TV, podcasting is doing for radio. In a few years time, you could hop into your car and switch on the podcast instead of switching on the radio. That is certainly going to happen! Check out this really interesting list. If you want to listen to this I’ve picked out the most interesting tools in this recording! Speechpad – Transcribing podcasts for posting on ConvinceAndConvert.com (and as LinkedIn blog posts). Candidio – Post production editing for Jay today video podcast. Bonus: Download the most popular podcast software and hardware shared by the top podcasters and also download our extra bonus where we share our setup for recording podcasts. our setup for recording podcasts. Blue Yeti Mic – Recording high-quality sound for the podcasts. Slack & Asana – Tools used to chat and communicate with the editing team about podcasts and manage the production aspect of podcasts. Adobe Audition: This is my one stop shop for recording, editing, adding sound fx, removing unwanted buzzing noises or the ever annoying dog barking…all in one place. Simply the most robust Podcasting tool in my toolbox. Auphonic: It’s important to tag your MP3 with important metadata and also make sure you and your guest’s audio levels are level. Auphonic allows you to do both in style! Google Hangouts: On our free weekly Podcast Workshops, Google Hangouts allows me to stream a video Podcast about how to create, grow, and monetize your Podcast. Simple, effective, and free, it has all the right combinations! Skype and Total Recorder: Tom Webster and I are busy folks so our goal when recording The Marketing Companion is to keep it simple. We do it from wherever we might be in the world over Skype and the podcast recording software I use is Total Recorder. This is inexpensive and uncomplicated, yet provides all the functionality a podcaster might need to get started. It has worked flawlessly, even when we mess up! Heil PLxT Boom Arm – Extremely useful tool for holding the mic in the right place. Audio Technica ATR2100 mic – Very affordable and delivers a great sound. Audio Hijack Pro: Used for recording conversations over Skype. iRig Mic Cast: Used for recording conversations on the iPhone when meeting someone in person. Audcacity: I use Audacity to record the show. I export that file into WAV format and then put it into a program called The Levelator to equalize the volume. From there, I import it back into Audacity and then export the file as an MP3. eCamm Call Recorder: Recording all conversations. Libsysn: Hosting all the podcasts. Click to Tweet and Pretty Links: My favorite podcasting tool is a combination of Click to Tweet and PrettyLinks for WordPress. By combining these two tools I create what I call a verbal tweet. PrettyLink allows me to say “Be sure to visit SocialMediaExaminer.com/love/ to let your friends know you love the Social Media Marketing podcast”. Click to Tweet allows me to create a single URL that I can use in PrettyLink. When that URL is visited it populates a tweet into folks Twitter stream recommending my show. SoundCloud – Used them for the Virtual Freedom podcast, and loved the social elements, where you can tweet episodes out and they’ll play directly from within Twitter itself – no need for another tab in your browser to open. AudioTechnica USB AT2020 mic – this piece of kit is affordable, super easy to use, and the sound that comes out of it is professional beyond belief. Couple it together with a decent pop filter, and you’ll sound like a radio DJ immediately! Audio-Technica 2020 USB Mic: I live by my Audio-Technica 2020 USB. Amazingly good quality and easy to use. Libsyn: I use Libsyn for podcast syndication. It makes it super easy for iTunes and Stitcher. Audacity: It’s not high-tech at all, but I use the free Audacity for podcast editing. No need to complicate things, and it’s super easy to use. Libsyn: I host my podcast with Libsyn so that I don’t need to worry about keeping those big files on my servers. It’s easy to publish a new episode, and they take care of sending to both iTunes and Stitcher for me. They also have a nice embeddable player which I put at the top of blog posts for audible versions as well as on the sidebar of my site so that you can listen to the latest episode. Blue Yeti Microphone: I love the Blue Yeti because it’s not all that expensive, but it sounds great. I’ve had it from the start of my podcast, and I don’t plan on replacing it anytime soon. I also got Blue’s pop filter to help soften the sound when I spit on my microphone during my drunken Pubcasts. Auphonic – Upload your content and they automatically take care of all of the post-processing for you, including compressing, noise reduction, converting to mp3 and tagging. Soundcloud – Not only do they store your audio files for you, but they also include a bunch of social sharing features that you just don’t get on other audio hosting sites. Sony ICD-UX543F IC recorder: Bought on a trip to Japan – Lots of memory, great battery, multiple recording modes, and good sound quality. After you record, you can plug it directly in the PC or Mac for immediate access to the voice files. I believe the simpler your podcast recorder is to use, the easier it will be to stay committed to your podcasting strategy. The portability of the device has allowed me to record podcasts at exotic locations like a London pub, a food court while eating ramen, and even a taxi cab on my way to the airport! Heil P40: For studio microphones, we have found that the Heil P40’s deliver audio quality that is amazing. It’s a durable and versatile mic and worth the investment. Behringer 1204 8-Channel USB mixer. This is a mid-level mixer in terms of cost but does the job very well as compared to higher priced Mackie mixers. Skype – Everyone uses Skype and it’s amazingly easy to not only call anyone anywhere but also to do live chat and video with them as well. Simple Podcast Press – More than just a sleek simple podcast player for your website, it’s also a great lead generator, publisher and promotion tool. Incredibly simple to set up yet surprisingly powerful, it works with PowerPress to help you grow your audience and list, see your international iTunes reviews, share links and more. One of my most valuable and recommended plugins. Levelator – An oldie but still the best at what it does. It’s a super-simple, no-configuration-needed, drag and drop app that automatically adjusts the audio levels for your wav files. Think of it as an auto compression, normalization, and limiting tool. It does all that and more and is much simpler to use than trying to do that individually in other podcast editing software packages. It is no longer being supported or updated, but the last version (released in 2012) still does a great job. Evernote – It’s the hub of everything I do for my podcast. From brainstorming show topics to bullet-pointing discussion points, to do lists, show notes, voice memos, and copies of articles or interviews I want to read later, it’s my #1 go to app on my Mac and iPhone. Rode Podcaster mic. It’s a dynamic USB mic (as opposed to a condenser mic), so it captures super clear crisp voice recordings. It’s perfect for recording at my home office, but it’s not easily portable. Handy H6 Recorder – On the road, I use the Handy H6 Recorder, which has a fantastic onboard mic for interviews, but also has four inputs for VGA mics I can use on-site at conferences and other events, so each interviewee has their own audio track. Easier to edit! Sony Pro Headphones – At home and on location, my headphones of choice are Sony Pro noise canceling dynamic stereo headphones. I catch any small noises or variations in sound quality early on, so I can fix them before I release a podcast to the public. An added bonus is that they block out airplane noise, which makes traveling much more enjoyable! Camtasia – I record using a VOIP (usually Skype) to call interviewees, and record podcast interviews using Camtasia editing software for the Mac. It’s much more versatile and intuitive than GarageBand and allows for video editing, so it works better for me than free podcast editing software like Audacity. Audio Hijack Pro – Every once in a while, the “system audio” track—the guest’s track—comes out with a clicking over it that makes the guest’s audio useless, so I’ve started backing up my system audio recordings using a program called Audio Hijack Pro. It generates a click-free MP3 that I substitute for the spoiled guest track in the relatively rare instance there’s a problem. ScheduleOnce – To schedule interviews, I use ScheduleOnce. It’s an incredibly helpful tool for handling logistics! Guests click your booking link and choose from the times and days you’ve programmed in. The system notifies me so I can approve the booking request and schedule the interview. After that, things get even better: the system automatically sends out booking confirmations and interview reminders, using messages I wrote. Canceling or rescheduling is easy, too—just one click! And after the interview’s over, guests get a follow-up email from me, thanking them for talking with me, and letting them know what happens from there. This service saves me hours each month! Focusrite Scarlett 2i2: My favorite podcast recording software is the Focusrite Scarlett 2i2 USB recording interface. I like it because it is easy to use, has two inputs for when I have in-person guests, I can monitor through headphones or speakers and it looks great on my desk. Auphonic: I love this tool because I’m not an audio whiz. I just upload my final edited podcast and it updates the file and handles a bunch of post-production enhancements bringing it up to professional audio standards making the audio sound silky smooth. Smart Podcast Player: This is hands down the best podcast media player available. It’s very easy to implement and makes it easy for your web visitors to interact with your podcast, show notes, and even download the file. It not only looks amazing and much nicer than any other player out there but, it’s mobile responsive making it look great on any device. As the mobile guy, this is a huge win with over 65% of podcasts being downloaded on a smartphone. Groove Tubes GT-55 Class A Condenser Mic: There are plenty of good dynamic microphones out there, but I prefer to go with a condenser mic, which gives a little boost to the signal. The sound is richer, deeper and makes your voice sound like velvet. Yes, they cost about $100 more, but you’re worth it, aren’t you? Alesis MultiMix 4 Mixing Board: I like the versatility a mixing board gives you — for example, if you need two microphones, a mixing board will give you the ability to change the volume or EQ on one of the mics while leaving the other one alone. That kind of flexibility makes the added expense of buying a small mixing board worth the cost. Garage Band: Where would we be without Garage Band? The amazing flexibility and level of professionalism make Garage Band a must for podcasting or any most other forms of audio production. And, best of all, it’s free! Apple software like Garage Band, iMovie and iPhoto are the gifts that keep on giving and giving. Podcast: Launching soon, see Jamie’s website. Zoom H4N – We prefer recording our episodes using a Zoom H4N recorder. We plug in our mic into the Zoom instead of plugging in a mic into a computer and using software to record. We find the sound quality to be superior when recorded on the Zoom. Apple’s Logic X – We edit our podcast using Apple’s Logic X. Logic is not the easiest audio editing software to learn to use but its capabilities in creating seamless cuts are great. It also allows you to boost volume using the compressor & adaptive limiter without clipping and/or distorting the sound. SoundCloud – We like using SoundCloud to host and share our podcast. SoundCloud allows you to embed your podcast episodes right into a Tweet, Facebook Post or any other social media platform. We love it for this reason! This allows your audience to play your episode right there on the SM platform like a YouTube video. It also allows listeners to like and comment at specific areas in the podcast episode. Talk about engagement. SpeakPipe – On weekend episodes we take our listeners’ questions- we call it Q&A Weekends. We love using SpeakPipe for allowing our listeners to send in recorded questions. They can record themselves asking their question via SpeakPipe, we get an email they submitted a question, we download the audio file and add it to the episode edit so they make a cameo appearance on the show. The listeners love it! Buffer – We use BufferApp to share our daily episodes on all our social media platforms. We use the SoundCloud embed feature here. Buffer allows us to ensure we can schedule our episode sharing in advanced so we aren’t chained to our laptops. Simple Podcast Press: It is an attractive, customizable, mobile-friendly podcast player that offers an opt-in for building your email list. TextExpander for Mac for instantly accessing guest invitations and other templates, ready-made Tweets, my online scheduling calendar, and so much more. Call Recorder – This just makes recording interviews a snap, no matter where in the world your interviewee lives. A $30 add on to Skype, you can record both sides of a conversation in both audio and video. If one of you is a loud talker you can split the sides of the conversation and adjust in the post. Plus, comes with some helpful other apps to make editing your podcast a snap. Garage Band – While many professional podcasters use high-end software, Garage Band gives me everything I need to create high-quality podcasts, laying down multiple tracks, adding in intros and outros with ease, and even dropping sound effects as needed. Simple and straightforward makes Garage Band the best podcast editing software for me. RODE Podcast USB Mic: I use the RODE Podcaster USB mic. It’s the best quality you can get without using a mixer. ECamm Call Recorder: I record interviews via Skype with Ecamm’s Call Recorder. It can do audio and video, and it can export out to multiple formats. Stitcher: Stitcher is my favorite app to listen to podcasts on. I have my podcast listed on Stitcher but I love using both the site and app to listen to podcasts from others. You can use Stitcher on your computer and on your Apple or Android devices to listen to your favorite shows. The cool thing about Stitcher is you can set up “stations” and organize the podcasts you listen to so regardless of the mood you are in you can find content to listen to! Spreaker: Hands down my favorite podcast recording software is Spreaker! I’ve been using it for a few years now to record my ‘on again and off again’ podcasts. As someone that doesn’t know a thing about sound equipment, it is THE tool to have. Spreaker has a built in “recording studio” they call the DJ Console that allows you to broadcast LIVE or record your podcasts to publish later on. Even better you can add in sound clips from their huge library of files or upload your own audio clips to use as an intro, outro or just during your show. Speakpipe: This is a free tool for leaving recorded feedback. This tool makes it super easy to get people to actually be a guest on the show without actually being on the show. They can record a short audio clip, ask a question, give a testimonial or provide some other feedback. It turns it into an MP3 that I can easily insert into my show. Pretty Link: This is a WordPress plugin that allows you to make a custom link that redirects somewhere else. This way instead of giving out https://www.speakpipe.com/NuclearChowder I can give out http://www.nuclearchowder.com/feedback This is branded to you and your site which looks more professional. Plus it is just a simpler way to communicate a URL. I can also use this tool to track clicks. I create pretty links for all my episodes with the same naming convention. Blubrry: Another WordPress plugin that can be used for hosting your audio and creating the podcast feed that you use to syndicate to iTunes, Stitcher and the other podcast networks. I simply use the plugin for feed purposes. The plugin allows you to setup your podcast on your blog. You take the URL for the audio that is uploaded to your media host and put it into the blog post (show notes) and it places a player in your post and sends the file to the podcast networks. Magic Action Box: This is another plugin for WordPress that allows you to put custom email opt in forms at the bottom of your blog post. I always tell people on my podcast how to get to the show notes. This plugin helps me build my email list. And the nice thing is I can create a very specific list for podcast listeners and then offer them an incentive to signup. Each post can have a unique email subscribe offer. iTunes Affiliate program: It’s free to join the Apple affiliate program. This will pay commissions but that’s not the main reason to use this tool. I use the tool to generate a link that will launch the iTunes application. Getting people to subscribe and leave a review is challenging enough. Any steps you can remove, the more reviews you’ll get. To leave a review, they need to be in the iTunes application. They won’t be able to do it from a web browser. To the affiliate link will take the listener to the website version of the podcast but will then ask to launch iTunes itself. Triberr: It is a huge part of my traffic strategy. Triberr.com allows you to join “tribes” of like minded people. I specifically setup my own tribe for business podcasters. Everyone in that tribe is a podcaster and we share each others content on social media. Triberr is a fantastic (and free) tool for building authentic relationships, growing influence on social media and having others share your show. SmartCast Player – I use this unique player on the side bar of my website. New visitors can instantly listen to my latest episode, subscribe to the show via iTunes & Stitcher radio. It is completely customizable for branding purposes. Note: Jared recommends the Podcast movement group if you’re looking to connect with other podcasters. Roland R-05 portable wave/mp3 recorder: Great tool and is used for recording all of my podcasts. Smart Podcast Player – Even though it’s far from perfect and still in beta, it’s filling a gap for on-page podcast listening much more elegantly than other options out there. Definitely, one to keep an eye on. Garage Band: We utilize good ol’ Garage Band when we’re producing our own shows, but the radio station we work with has professional studio software (no idea what they use, but it sounds amazing!). We distribute Edge of the Web Radio ( http://edgeofthewebradio.com/ ) on iTunes, Stitcher and BlogTalkRadio. We don’t use the BlogTalkRadio system to record because the quality is terrible – but they do have incredible reach where we’ve had over 3 million listens! Personally, I listen to all the shows I subscribe to on Stitcher for mobile and iTunes on my desktop. Zoom H2n Handy recorder – For recording when out and about. Audio-technica mic (ATR2011-USB) – Low cost and adequate audio quality. Gotomeeting – I record an interview with a guest using the record feature in GotoMeeting. Garageband – The output of Gotomeeting is passed to Garage Band for editing where I insert a custom intro, a custom message from a sponsor, a custom outro, and I’m done. Libsysn: The podcast is hosted on Libsysn and about a minute (or five) later it shows up in iTunes and Stitcher. Rod Podcaster Mic – Easy to set up and perfect if you don’t want to get into audio mixer setups. 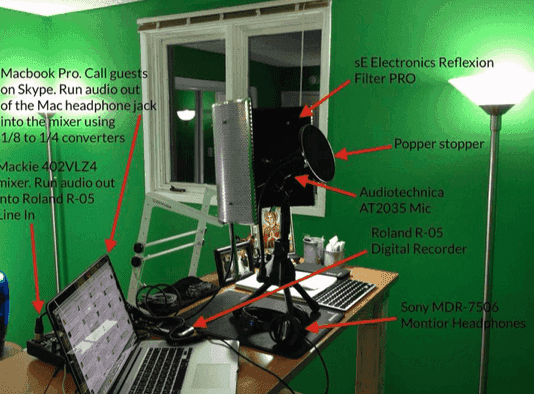 Rode Podcaster booming kit: This includes the mic and stand. SuperTintin: This is a Skype video recorder that I use on my PC to record video and audio for my interviews. It’s about $30, very easy to use, and you get high quality, picture-in-picture videos to upload onto YouTube or Vimeo. For a 40-minute long interview, the video file is about 350 MB; the audio file is about 40 MB. When I am on my Mac, I use ecamm. They are both reliable and offer a short learning curve. Adobe Audition: The best podcast editing software. Audioshell: When your subscriber opens the audio version of your podcast interview, you would want it to be named, copyrighted, described, categorized, and looking pretty with your logo’s artwork. AudioShell is perfect for these purposes. Ecamm call recorder: I record all of my interviews via Skype and use Ecamm’s call recorder. The $29.95 is a small investment to get consistent, good audio quality for my interviews. It’s easy to install, easy to use and priceless for anyone doing an interview format. Twisted Wave: I actually use two different audio software for my recording and editing. Twisted Wave is a great audio recording software for iOS. I especially love that I can download a version of this software onto my iPad Mini for my mobile recording needs. It’s super slick! Adobe Audition: Adobe Audition is my “go to” audio software, especially for multi-track editing. I subscribe to the Creative Cloud (https://creative.adobe.com/products/audition) version for $20/month and always have the most current software. Formstack – Interview formats must have a solid pre-episode process to be successful and one piece of that process is the guest questionnaire. I use Formstack to create custom guest questionnaires for all the interview format shows I work on. Their software is very easy to use and offers multiple question types to accommodate most any question you want to ask. It’s very easy for my guests to complete online and submit back to me without the hassle of emailing back and forth. Sound byte: One of the best podcast software is Sound Byte by Black Cat Systems. If you listen to the Social Media Social Hour, you’ll notice I’ve used a variety of sound bytes or drops. For example, my intro music, outro music, features, etc. Sound Byte is the tool I use to keep these audio files ready for me to play with one click of the button. This is a very similar technology that professional radio stations use, but it’s great for podcasters. They do offer a free trial and the software application is a one-time cost of $39. Libsyn for hosting and streaming – Libsyn has been rock solid as the host of my podcast files. They have the tools I need and the ease of setup makes it a great platform for me. I load my mp3 files to Libsyn add my cover art and description, and I’m all set. I like the fact that I can schedule when content goes live, allowing me to work ahead. Audacity for compiling and editing – Sometimes free can be just what you need! I use Audacity to edit my recorded podcasts and then compile by various tracks together. I have a system down with adding my intro and closing clips, enabling me to quite quickly generate and export a quality mp3 file that’s ready to upload. Blubrry PowerPresss for WordPress – Blubrry is my WordPress podcast plugin of choice. My goal was “simplicity.” I wanted to make the effort of publishing a podcast simple and to have a “hands-off” approach of getting the feed into iTunes. PowerPress makes it easy and I love them for it! I paste in my mp3 file location form Libsyn, set up my blog post, publish and I’m done! I wanted to focus on the actual podcast interviews and the content that was created, not the technical and production pieces. The tools I use have enabled me to do just that. Most of the setup was simply one time to get my podcast into iTunes and Stitcher, allowing me to focus on the actual content. Besides my Libsyn hosting, all the other tools are free, enabling me to have a low-cost, rock-solid quality podcast show. 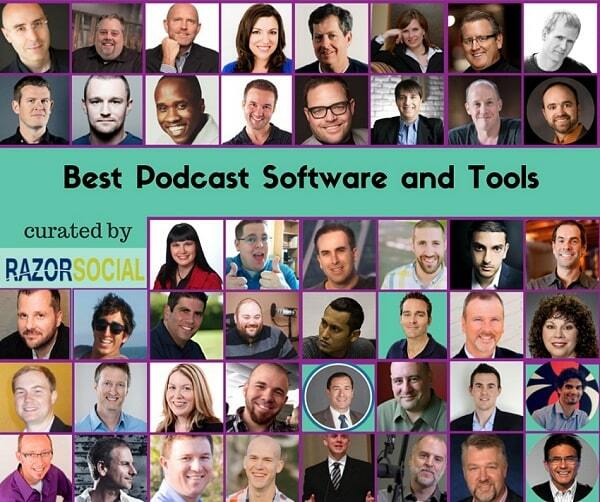 As a Tech & Social Geek jumping into podcasting as a newbie I’ve found the list of tools to be overwhelming but the more I tested the more I liked the tools I was already familiar with as a mac user. I found that diving into the tools too deep just caused more confusion and the key to the great podcasts that I enjoy is quality sound and quality guests. I utilize Garage Band for podcast editing, Evernote for show notes and Google Hangouts for interviewing guests as I like being able to look them in their digital eyeballs before and after the interview as it seems to provide a much more engaged conversation. Podcast: Not launched yet, see website. Audio Technica AT2020 USB Mic – This is the USB mic I use for my own personal podcasts and my virtual summit, and pretty much everything when I need better sound quality. It’s well priced, a pleasure to use, easy to speak into and makes you sound great. Skype + Ecamm Call Recorder (Mac only) – I use this Skype plugin to record video interviews. I highly recommend it because it will let you split your side of the conversation from your guest’s (make sure you use the setting “multi-track advanced” in Skype). That makes editing easier. If, for example, your guest’s audio is too low, you can raise the volume on his side of the conversation without touching your audio. Screenflow (Mac only) – This is my screen recording and editing software of choice. I use it to put together my video interviews with intro/outro and then I export them to an mp4 file and use Auphonic to get the mp3. I don’t really edit much at all since I like to keep it raw. Auphonic – This tool is amazing, and I couldn’t live without it. It just saves me so much time every month when I publish new podcast episodes. Auphonic is a freemium service (it used to be free), but I use the premium version since I have quite a lot of video/audio interviews I need to get done on a monthly basis. With literally one click of a mouse, you get noise and hum reduction, audio leveling and much more automatically. And not only that, but you can also push your podcast episodes with one click to Soundcloud, YouTube, Libsyn and a few other supported alternatives you may use for your show. Try it and thank me later! Soundcloud – I’ve used Soundcloud as my podcast host since day one as I was accepted to the podcast beta program. It has been great so far, and they will keep improving the experience and features over time for podcasters as well. A big advantage over Libsyn is that it’s quite a bit cheaper, especially if you’re publishing episodes more often. Soundcloud is also amazing for social sharing on Facebook, Twitter, and Google+. Audio Hijack Pro 2. I use this to record the audio directly from Skype as I am recording interviews. It can also record audio from Safari. I highly recommend it. Audacity. I’ve been using this free podcast editing software since I began podcasting in 2005. I love it! Refresh. Refresh.io is a wonderful iOS and web app to research my guests before I interview them. It delivers an email dossier of each guest based on publicly available information from their social media accounts. It’s fantastic. Audio Technica at2020 microphone when I’m in the office. When I’m on the road I use my iPhone. Audacity: I’ve used Audacity to edit all 101 episodes of my show. Google Calendar – I feel this tool is overlooked as one of the most important things you have to do on your podcast is to book guests. Google calendar offers a great way for me to send invites to my guests ahead of time allowing me to better plan my schedule. Libsyn for hosting – Libysn is a podcast hosting & publishing service and works great for me as it allows me to upload my podcasts directly to their hosting which means the data isn’t stored on my website allowing it to load a lot faster. The best part is you can also schedule and even upload directly to iTunes. Pamela for Skype – I personally use Windows on a PC so Pamela works great for me as it allows me to record Skype calls with great audio quality to use in my podcast. It also archives the conversations allowing you to come back anytime to edit to re-listen to a conversation. Yeti Mic: One of my favorite tools is my Yeti mic. It allows me to have a great voice sound and I can mute myself when guest hosts are delivering their content, letting cough if I ever need to off-air. Garageband: Garageband is my favorite software for interviews. I can go back and make snippets and sound bytes easily to promote shows or pull off a segment from the episode to deliver as a stand-alone. Windows ID3 Editor – For tagging MP3’s with episode data and image. It’s not expensive and it works great. Soundforge PRO 10 – I love this stereo audio editor. The Normalize feature is very handy for scanning the entire file and then adjusting the loudness based on RMS levels. This way I get to set every episode to the exact same loudness level, so when folks listen to my show it’s always at the same level. This is an overlooked but important consideration. iZotope Multiband Compressor – This plugin came with Soundforge, and it works really well as mastering compression for my final mix stereo track. It helps level out peaks in 4 different frequency ranges, for instance when there are loud bass frequencies the compressor will squash the low end but leave the mid and high alone. The SoundByte app on my iPad Air – This is a soundboard app with many programmable squares. I use this to play show theme music and sound fx. I load sounds onto the iPad then program each square to play a different clip, song, etc. JK Audio Broadcast Host – This is what I use for patching phone calls into my mixer. It works well but it’s not cheap; I think it’s around $450 or $500. Most podcasters invite their guests to join their show via Skype, but not everyone is on Skype or internet-savvy. dbx 166XS dual compressor/limiter/gate- This is a really good sounding unit, and I love it for two specific reasons which save time and quality for us podcast engineers because it’s not easy to adjust a compressor quickly to suit each guest and host: 1. The “OverEasy” button automatically adjusts the compression and ratio to be more transparent. 2. The “Auto” button automatically sets the attack and release times depending on the source signal. Heil Shock mount- This is a mount that hangs from the retractable arm and allows you to get away with bumping it without causing any damage to the microphone (which I’ve accidentally hit several times with no problems). Heil PL2T Retractable boom- This retractable boom allows you to pivot, swing, elevate and project to any setting that is comfortable for you while you’re using it. Mackie 1402-vlz3 mixer- This is a nine-channel mixer that allows you to smooth out and mix your vocals as well as any other inputs. This is essential to providing a professional sounding podcast. Sennheiser HD 280 Pro- Over the ear headphones. This allows me to stay hyper-focused with the people I’m interviewing, while completely blocking everything else that’s going on. Roland Recorder– Great for mobile and studio recordings. The sound quality of this recorder is incredible. No matter if you’re inside a controlled environment like the studio or outside in an imperfect environment for recording. Podcasting is a big growth business. Of course, the content is more important than anything but having the best podcast software helps you deliver a higher quality service.